MIAMI (AP) — The Miami Dolphins arrived at their bye week a .500 team, which is no surprise because for the past quarter century they’ve been a .500 franchise. Their record since 1994: 197-197. Their record this year: 5-5. 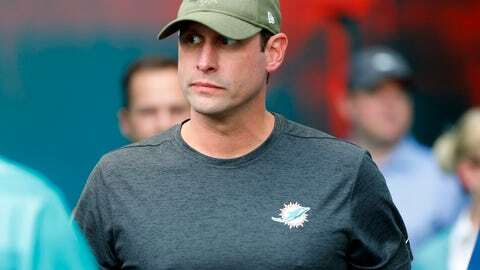 Coach Adam Gase’s three-year record: 21-21. If there’s a middle of the pack, the Dolphins are in the middle of it. They haven’t won a playoff game since 2000, but they could well be headed for their third 8-8 finish in the past six years. Far from perfect, for sure. Given the way the season has gone, it’s amazing the Dolphins can still talk with a straight face about making the playoffs. They’ve been decimated by injuries, including the loss of quarterback Ryan Tannehill for the past five games. They’ve been outgained by 787 yards, third-worst in the league, and outscored by 57 points. They rank 28th in offense and 26th in defense. Yet they began the week with the eighth-best record in the AFC, while eight teams had worse records. In sum: more Miami mediocrity. The next one will be Nov. 25 at Indianapolis, with Tannehill hoping to return from his throwing shoulder injury, although that may be a long shot. Only two of the six remaining games are against teams with winning records. So it’s not impossible for Miami to actually make the playoffs for only the third time in the past 17 seasons. A bye week may not be enough time to resolve the Dolphins’ many issues, however. That could take an offseason or three. For starters, the Dolphins are on pace to allow the most yards in franchise history. Their run defense ranks last in the league and seems to be getting worse, with 174 yards allowed per game and 5.9 per carry over the past five weeks. Defensive dysfunction is such that two-time Pro Bowl safety Reshad Jones took himself out of a game because he was unhappy with a plan to rotate personnel. And then there’s the offense, which has gone nine quarters without a touchdown. In the past three games receiver Danny Amendola has thrown for more scores (one) than quarterback Brock Osweiler (none). “This football team deserves touchdowns,” Osweiler said. Osweiler has been critical of his play as Tannehill’s replacement, and he’s not alone. But bad luck has been an offensive culprit, too. The Dolphins lost their most dynamic player, receiver Albert Wilson, and two starting offensive linemen to season-ending injuries, and three other injured linemen sat out last week’s loss at Green Bay. Bad health is less of an excuse on defense, where Gase’s decision to jettison tackles Ndamukong Suh and Jordan Phillips left holes that haven’t been filled. Yawning run gaps and blown coverage are staples, calling into question the future of second-year coordinator Matt Burke. That’s a topic for the offseason, along with the future of Tannehill. First the Dolphins will try to summon a late-season surge, which would be something new. Over the past decade, their record in December is 22-22.